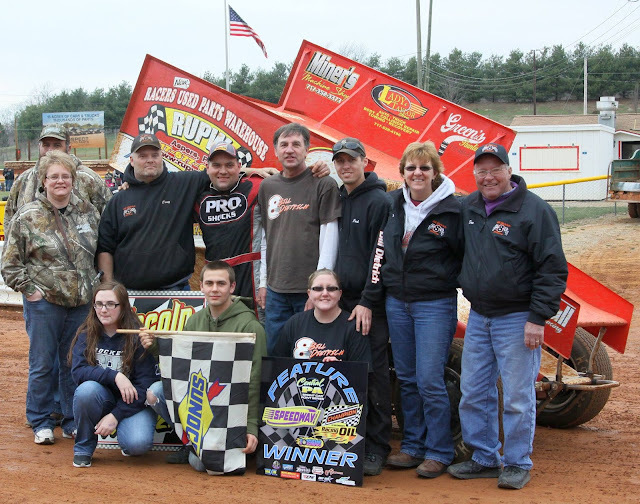 ABBOTTSTOWN, PA 3/12/16 – It’s not uncommon for the name Dietrich to be in victory lane at Lincoln Speedway. But this time it was older brother Billy Dietrich who came out on top of the 25-lap 410 sprint car feature Saturday afternoon as his younger brother and former track champ Danny crossed under the checkered flag in fifth spot. Dietrich also knows how to impress a new sponsor, Ramsey Construction who joined the team earlier in the week and was on hand to witness Dietrich’s second career Lincoln Speedway 410 Sprint car win. Dietrich lined up third and quickly took the second spot as polesitter Glenndon Forsythe grabbed early lead. While Dietrich chased Forsythe, several great battles were taking shape between Shane Hoff and Kyle Moody and Danny Dietrich and Cory Haas. Dietrich pulled alongside Forsythe going down the backstretch as the frontrunners split the lapped car of Brandon Noel in turn four with Dietrich emerging as the race leader. The only red flag of the day came out on lap nine when Brandon Rahmer got into the second turn catch fence after contact with another car. Billy Dietrich set the pace as 5-time defending track champion Brian Montieth, who started 13th, moved in to battle Danny Dietrich and Cory Haas with Montieth taking fifth place on lap 12 and moved into fourth a lap later. Dietrich caught the rear of the field with about eight laps to go as Forsythe, Hoff and Montieth quickly closed. Montieth continued his charge, taking third from Hoff with 20 laps complete and tried several times to get under Forsythe but was unable to make the pass. Dietrich held on in traffic to capture the $3,200 payday to become the third different winner in as many races so far this season in the Pigeon Hills oval. Dietrich took the win ahead of Forsythe, point leader Montieth with Shane Hoff crossing fourth for his career best finish. Fifth went to Danny Dietrich ahead of Cory Haas, Adam Wilt, Gerard McIntyre, Jr., Kyle Moody and Alan Krimes. Heats for the 21 sprint cars on hand were won by Brandon Rahmer, Gerard McIntyre, Jr. and Austin Hogue. Lincoln Speedway switches to evening racing next Saturday night, March 19th, at 6 PM with the 410 Sprints being joined by the 358 Late Models. Gates open at 4 PM. Lap Leaders - Glenndon Forsythe (1-7), Billy Dietrich (8-25).